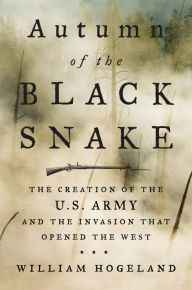 William Hogeland is the author of the new book Autumn of the Black Snake: The Creation of the U.S. Army and the Invasion That Opened the West. 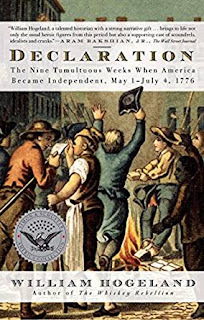 His other books include The Whiskey Rebellion and Declaration. He lives in New York City. Q: The first chapter of your new book focuses on the death of General Richard Butler. What was particularly significant about this historical episode? A: Richard Butler died in November of 1791, during the victory over General Arthur St. Clair by a confederation of indigenous nations. That victory -- a horrible defeat for the newly formed United States -- represents a major historical turning point, little discussed today. On a bank of the upper Wabash River in modern-day northeastern Indiana (in what the U.S. then called its Northwest Territory), nearly the entire force of what passed for an American army was wiped out in a matter of hours. It thus became painfully clear that American efforts to assert sovereignty in Indian country were fatally flawed. President Washington's policy had been to say there was no real war ongoing for that territory -- just a few recalcitrant Indians who needed mopping up. The defeat of St. Clair showed: a) there was a war going on; b) the United States was losing it. Westward expansion, on which the financial and political hopes of American elites depended, looked stymied. As a result, the United States formed its first real, national army and began the difficult process of conquering that territory and moving its inhabitants to small, reserved areas. So begins the birth of the United States as an expansionist power and the process of removing indigenous people on behalf of land investment, without which the United States as we know it would not exist. That wheel turned from 1791 to 1795, during the Washington administration, and that's the story my book tells. Q: How did you research the book, and what particularly surprised you in the course of your research? A: There's so much to this story that getting a handle on responsibly researching its many facets was a major challenge. There's nothing in my book that was unknown to scholarship before I got here, yet this is the only book that pulls it all together -- the national turning-point war for the old Northwest, told from both sides; and the cutthroat politics of forming the nation's first army -- in a cogent narrative, the only book to present the events as a foundational American story. I read much secondary material on broad matters ranging from 18th century military discipline to the French fur trade to the ethnology of the Native nations of what is now the Midwest, and much more. 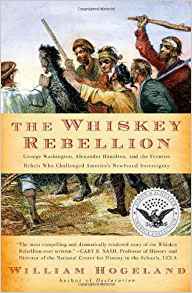 I read about gritty specifics of the relationship between the leaders Little Turtle and Blue Jacket, the strategy and tactics of General Wayne -- Mad Anthony -- who did finally succeed in the conquest, and the lives of amazing characters like the Shawnee British official Alexander McKee and many more. The only way to realistically piece together the blow-by blow politics of forming the army, the fake diplomacy that President Washington used when treating with the indigenous confederation, and the activities of British officials in Canada is to work closely with the primary record: the American State Papers, the Congressional Record, Jefferson's notes on cabinet meetings, Washington's papers, Governor Simcoe's papers, etc. Most of that material has of course been carefully published and often brilliantly annotated. I also read many of Anthony Wayne's papers in the original; they're scattered in archives. And I traveled to every important place that plays a role in this story. As to being surprised, I guess what I found most new is the complexity -- the sheer familiarity -- of the political and economic wheeling and dealing among the Native leaders and nations. There are two groups of people that many Americans today often place "beyond politics": the founders and the Indians. This book reveals all players as sophisticated, adroit, sometimes ruthless political animals. Q: What were some of the key considerations facing George Washington when it came to the creation of a U.S. army? A: There was enormous political opposition to creating a full-fledged, uniformly run, national U.S. Army. That seems strange to us today -- the U.S. military is a gigantic world-historical force -- but it had to start somewhere, and that's what my book is about. Many people in the founding generation opposed what they called the "standing army" as a tool of monarchical tyranny, like the British Army that the U.S, had just defeated. They believed in recruiting from the state militias for short-term engagements; they hated the idea of maintaining a force in peacetime. Washington and most of the cabinet had always wanted a national army, but Congress had refused to create one of any legitimate size. Then the St. Clair defeat of 1791 shocked the nation: it enabled Washington to pressure Congress to pass the first real army bill. Still, getting the votes was a tricky thing, involving dealmaking, horsetrading, private agreements, adroit use of the press -- all of the things that passing bills always requires. Politics junkies will enjoy the details, I think. Q: What do you see as the legacy today of the issues you describe in the book? A: The legacies just seem overwhelmingly decisive, which is why I remain amazed that this story isn't better known. For one thing, the first-ever victory of the U.S. Army, under Wayne at Fallen Timbers near what is now Toledo, started something that has ballooned around the globe. Here begins American empire, first for western land and natural resources, then around the world for influence, business, hegemony, making the world safe for democracy, the whole thing, however you look at it. The Midwest was conquered: in the blink of an historical eye it was transformed into the booming industrial driver of American economic power. 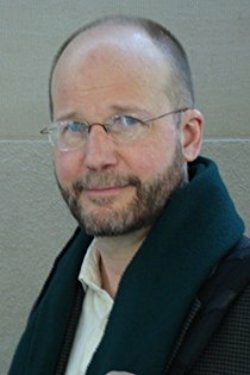 Native Americans west of the Ohio River begin being moved onto reservations -- also a calamitous and decisive event, without which the United States would not have existed and developed as it has. As we face a crisis today, in what we mean by "American greatness," this story tells us how we began to become great -- meaning "big" -- and what some of less closely considered costs may have been. A: Lots of ideas cooking, but nothing cogent enough to talk about yet, I'm sorry to say.